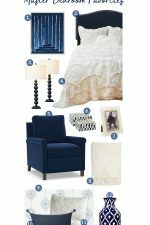 Lighten and brighten your bedroom for summer with these 7 simple summer bedroom decorating ideas! 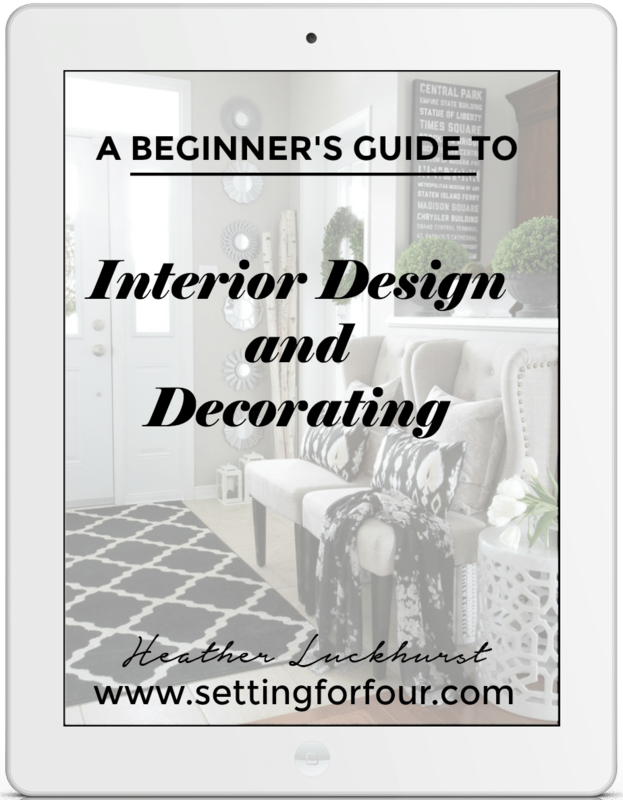 Read my design tips on selecting summery color palettes, bedding, fabric patterns and art! Choose a color palette for summer that is lighter than you would use in the winter and incorporate beachy colors like sandy beige, beach pebble gray, watery blues and summer whites. Instead of a beachy look you could also go with a summer garden color palette of yellows, greens, pinks or mauves! 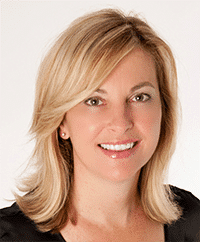 See my bedroom go-to gray wall color that I absolutely love and all my paint colors here! SHOP THE LOOK! 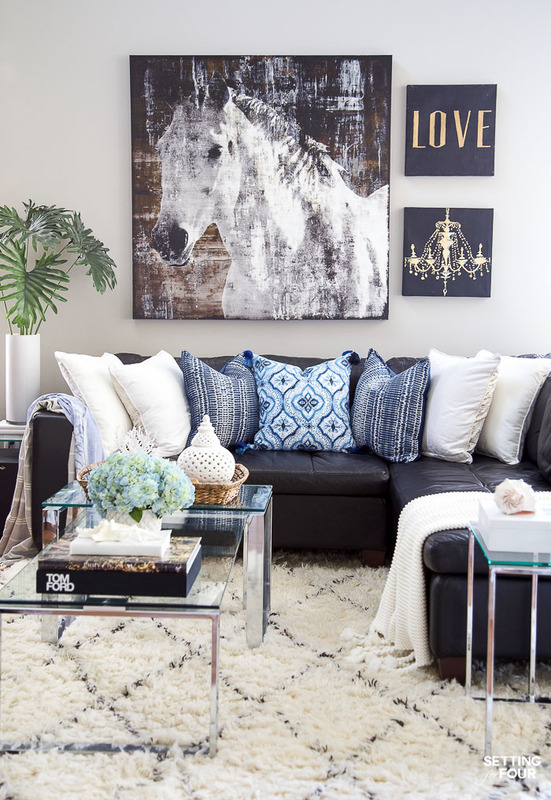 CLICK ON THE PICTURES BELOW AND SCROLL USING THE ARROWS TO SHOP EACH ITEM TO COPY THE LOOK OF THIS ROOM! 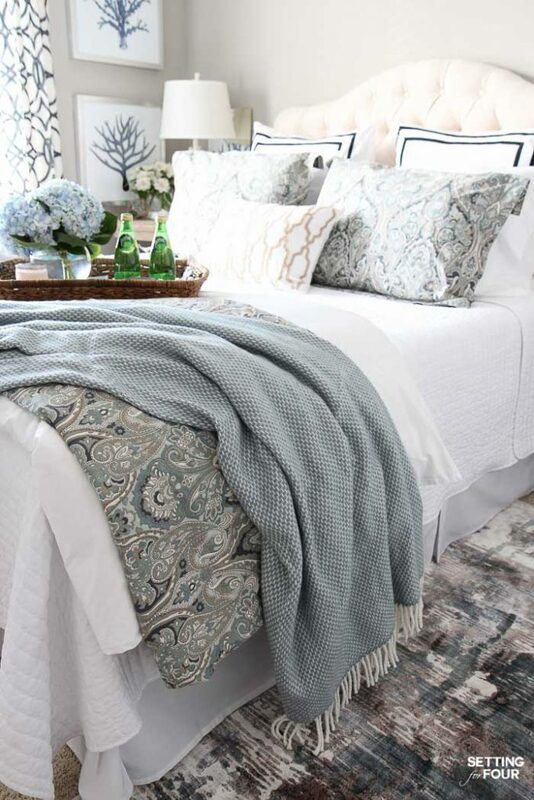 A summer bedroom looks amazing with coastal style added to it! 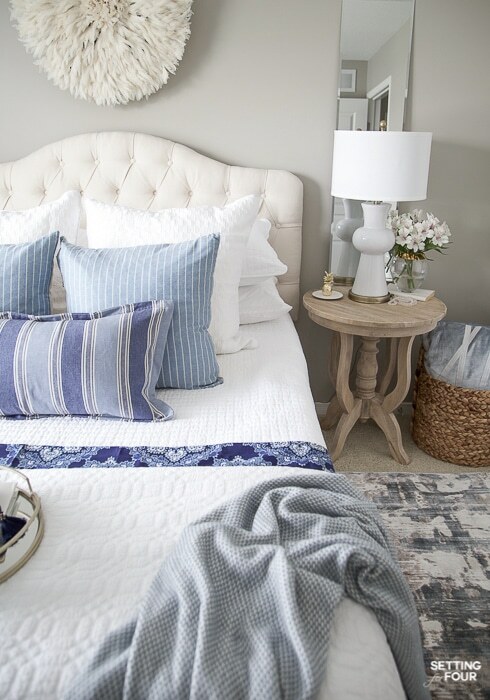 Wether your bedroom has an overall traditional, boho, farmhouse or glam style you can add coastal style accents to it in the bedding, throw pillows, art and decorative accents. 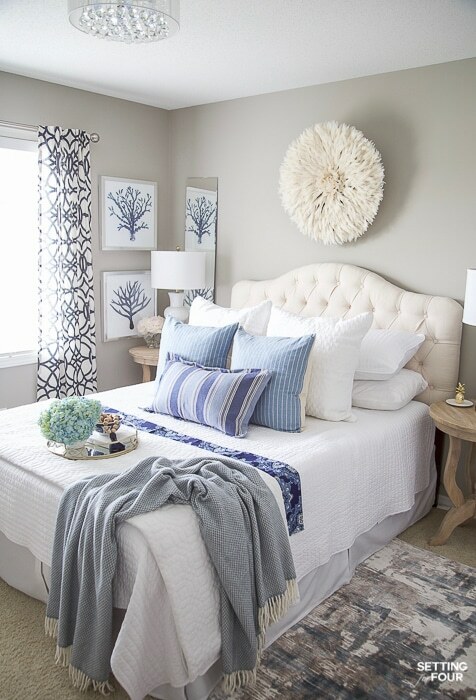 I added coastal style to this bedroom with the beachy blue colors and also with shell decor. 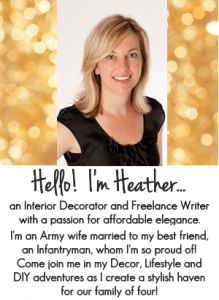 I have a huge collection of starfish and shells – summer is the perfect time to display them on night tables and dressers! Replace heavy duvets and flannel sheets with lightweight breathable cotton blend sheets and a quilt. I love using white quilts! I place one on the bed and a second folded quilt at the end of the bed instead of a duvet to add warmth on cooler nights. If you really love duvets you can add a lighter summer weight duvet. Add a throw blanket or two to the bed and a side chair. Accent pillows are wear you can really make a summery statement to your bedroom and bring in gorgeous color and pattern! For patterns, stripes are perfect for summer! Pin stripes, awning stripes and chunky stripes all work! 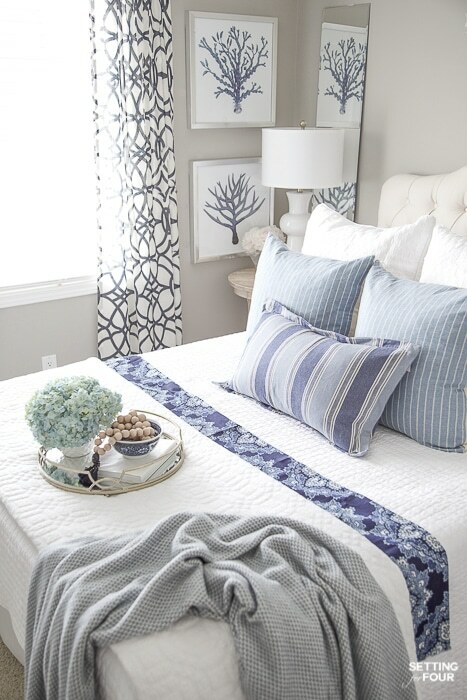 I love these two chambray blue and white pin striped throw pillows paired with the wider awning stripe lumbar pillow. 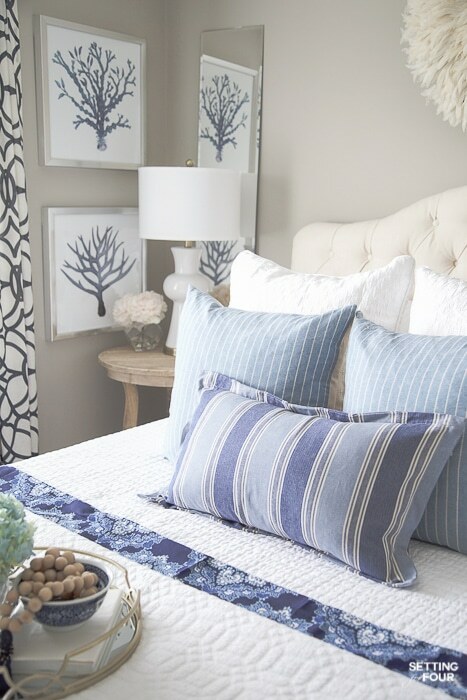 Incorporate summertime watery blues, blue-greens and nautical navy to your accent pillows. 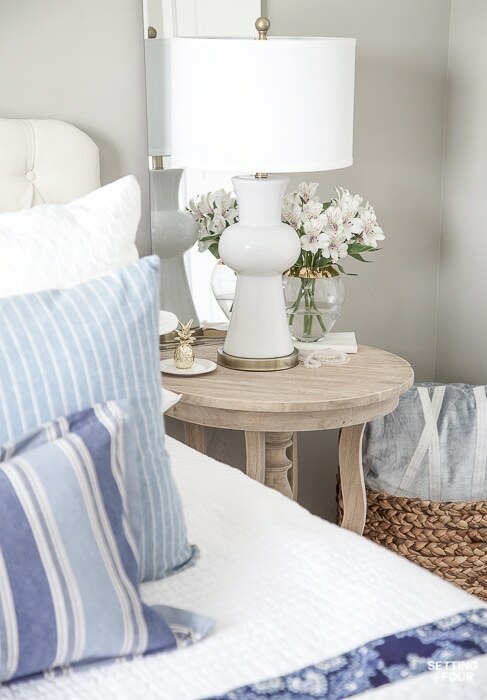 Use baskets that are made from natural materials like wicker, sisal and hyancinth grass to lighten and brighten your bedroom for a fresh summer feel! 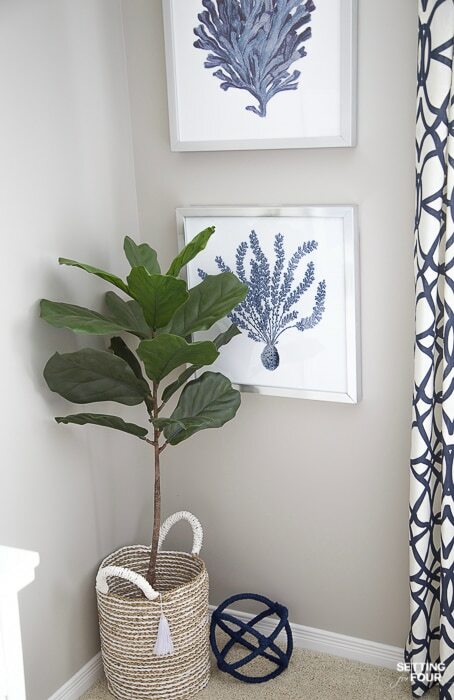 Baskets can be used to store extra throw blankets and are perfect for a tree like this gorgeous faux fiddle leaf fig tree. 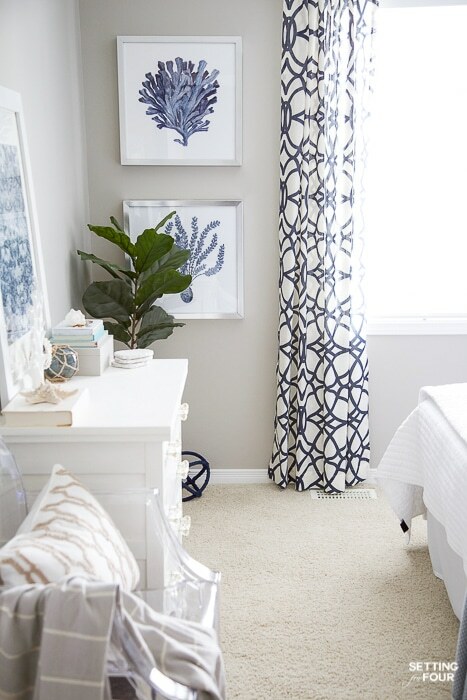 I love the thick, pliable leaves on it and the pop of greenery that it adds to our bedroom! At just 4 feet tall it’s perfect for small bedrooms and larger ones too! I love this basket that I put my fig tree in – it has a beautiful tassel hanging from one of the handles! So fun! I’m also loving the white stripes too for another nod to summer. 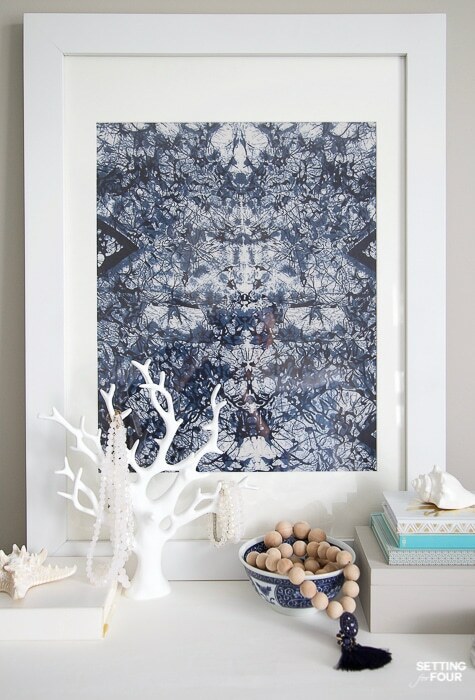 I kept the beautiful Indigo coral wall art on the walls – because I’m obsessed with these coral prints and the indigo color!! Plus they fit in perfectly with the white and blue summer look I’m going for. To add another touch of blue and white to the far wall of the bedroom I made some simple DIY art. This super quick and easy DIY art project literally took less than 5 minutes to put together! I pulled a large white frame out from storage, took it apart and wrapped a beach sarong in a blue shibori print around the backer board of the frame! I’ve had this beach sarong since I was a teen and still love it today! You could also frame a beautiful scarf. I wanted to reuse my beach sarong later so I didn’t cut the fabric and I found a trick to disguise all the extra fabric too. I love how my DIY art turned out! Do you? I’ll show you in more detail how I put it together in an upcoming post! 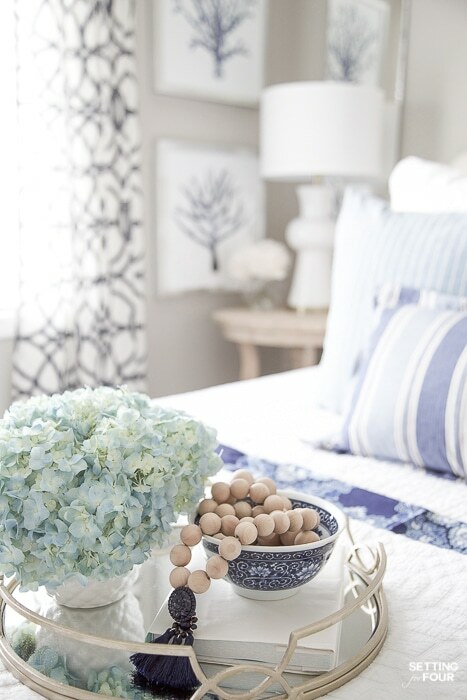 Of course a summer bedroom wouldn’t be complete with a bouquet of beautiful blooms! Head to your garden and snip off some fresh flowers or head to your grocery store to pick up some! I bought these blue hydrangeas at our local grocery store and added them to a white ceramic pineapple jar with the lid removed! I hope you like these 7 Simple Summer Bedroom Decor Ideas! How do you give your bedroom a summer look? 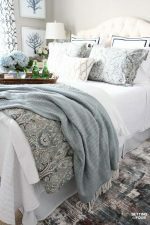 ….and check out my previous bedroom bedding and decor!